Ice and snow are a fact of winter in most parts of the world. In some places, they’re even more common. Over the millennia of human history, people have developed plenty of ways to have fun with icy conditions. 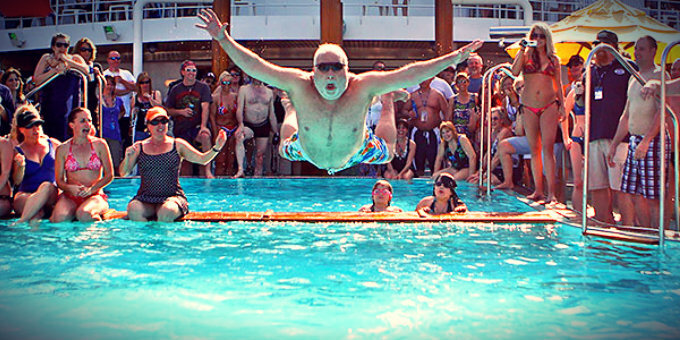 Some of these activities have evolved into competitive events played all over the globe. Here are some of the ice sports with the longest histories. Sleds and sledges have been used since ancient times, particularly in areas with heavy snow cover. Today, there are three main competitive sledding sports: bobsled, luge, and skeleton, which are all derived from the same situation. In the Swiss spa town of St. Moritz, hotelier Caspar Badrutt frequently hosted English tourists. In the 1870’s, guests at Badrutt’s hotel started using delivery sleds to race down hills and roads in St. Moritz. Sledders frequently interfered or collided with pedestrians, which, coupled with the roads’ many twists and turns, required a means of steering the sleds. This led to two developments: First, Badrutt built an ice track designed for recreational sledding. Second, Badrutt’s guests invented the three modern competitive sleds. Bobsleds (or bobsleighs) are steered with two metal rings attached to a pulley system that turns the front runners. At the high speeds of competitive bobsleigh, turns must be subtle to prevent crashing. Passengers sit. 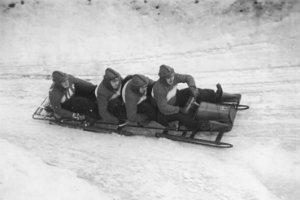 At one time, five or six people would be on a bobsled crew, but in the 1930’s, the crew size was reduced to two or four people. In a two-person team, a pilot steers and a brakeman pulls the brake lever at the end of the race. A four-person team also has a pilot and brakeman, but adds two pushers. Luges are manned by one or two people. Lugers lie on the sled feet-first and steer by applying pressure to the runners with their calves or shoulders. The first record of the worbobsled oldd’s use is from 1905, from a Swiss dialect of French in which “luge” referred to a “small coasting sled.” The gloves worn for luge racing have tiny spikes built into the fingertips, allowing for maximum speed gain at at the start. Skeleton sleds are named for their simple, bare appearance. There are no steering or braking mechanisms; riders steer only by shifting their body weight and usually brake with their boots. Skeleton sleds are ridden by a single passenger lying head-first on their stomach. 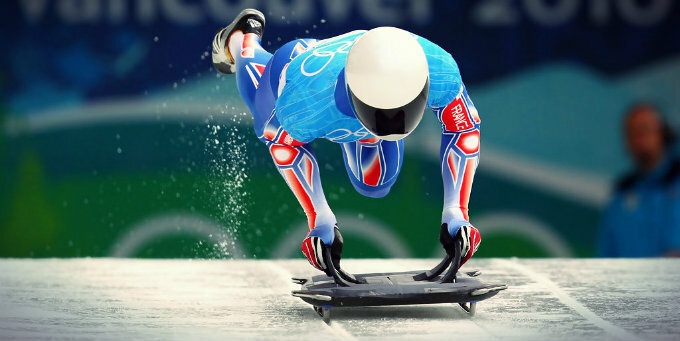 Top skeleton riders can reach speeds upwards of 75/mph. Sometimes referred to as “chess on ice”, curling is played by two teams of four players each. 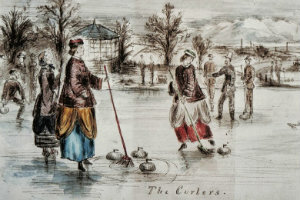 The length of ice used for play is called a curling sheet, marked with a circular target area (or “house”) at each end. Players take turns sliding round stones of polished granite to the opposite house. Two sweepers use brooms on the ice to direct the stone’s path. When each team has thrown all eight of their stones, an end concludes, and points are counted according to the stones closest to the center of each house. Most games have eight or ten ends. Curling was invented in medieval Scotland, and today the World Curling Federation has its headquarters in Scotland. Curling existed at least as early as 1511, based on the year’s inscription on a curling stone found in a drained pond in Dunblane. The first reference in writing appears in a document from 1541, but the word “curling” was not used to describe it in print until a 1620 poem by Henry Adamson. The word refers to the motion of the stone across the ice. In the early days of curling, stones were not uniform. Players used flat-bottomed river stones of varying size and shape, contributing to poor control after a throw. This is a contrast to modern curling, in which sweepers can direct the stones and do so deliberately. Other regions tried to solve the inconsistency with wood, irons, or tins filled with ice. Curling has been on the world stage since 1959, when the first world championship was held in Scotland. Only men were allowed to participate in the first Scotch Cup. Demonstration matches were held at the Olympic Games in 1924, 1932, 1988, and 1992, but curling was not an official Olympic sport until 1998. It remains so today, with separate tournaments for men and women. Like sleds, ice skates have been around for a long stretch of human history. The oldest evidence comes from a pair made of animal bone found at Lake Moss, Switzerland. These skates are dated to 3000 B.C. 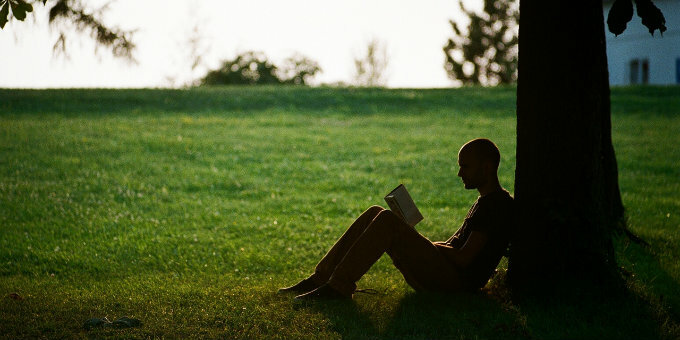 The earliest known reference in writing is from the 12th century, which also describes edgeless skates made of bone. The Dutch invented the first steel-edged ice skates in either the 13th or 14th century, and a height-to-width ratio for blades was established shortly afterward. The original Dutch designs have been only minimally altered in the centuries since their invention. 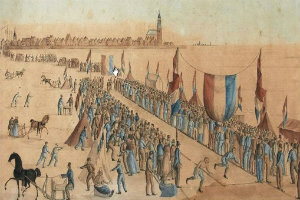 The first ice skating association was the Edinburgh Skating Club, formed in 1742. Contemporary writing suggests that the Club practiced an early form of figure skating, but figure skating didn’t become “official” until 1772. Robert Jones, an artillery lieutenant in the British military, wrote and published an instructional book on ice skating that went over basic forms. The publication of this book is seen as the point when skating split into figure skating and speed skating. Credit for the invention of modern figure skating goes to an American, Jackson Haines. In 1864, he won a skating championship by being the first skater to use dance and ballet in his movements, rather than following the British method of tracing patterns on the ice. He invented the sit spin skating move and a blade with a shorter length and curve that made turns easier. Americans and Britons still preferred the British mode for some time, but Haines popularized his forms in Europe. Vienna was particularly impressed, and the Vienna School developed his techniques, eventually forming the International Skating Union in 1892, seven years after Haines’ death. 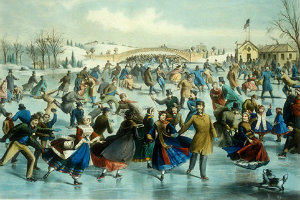 As the world’s first international organization for ice skating, the Union codified rules for figure skating. It still exists today, though it has moved from its original home in the Netherlands to Lausanne, Switzerland. Figure skating first appeared at the Summer Olympics in 1908. It was the first winter sport to be held at the Olympic Games, 16 years prior to the first dedicated Winter Olympics. A variety of stick-and-ball games have existed for millennia, going back to before Christianity. 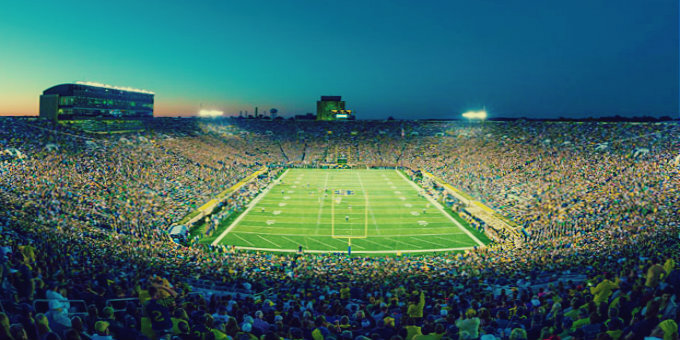 In Europe, most of these games were not far removed from field hockey, such as Ireland’s hurling, Scotland’s shinty, and England’s “bandie ball” (now commonly called bandy). 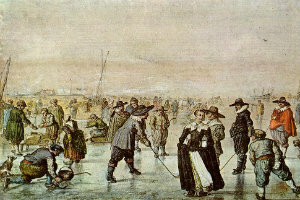 The Dutch and Norse played similar games on ice. But the first evidence of modern ice hockey comes from the 1700’s, when people in Britain would play “hockey on ice”. Rather than a ball, they would use a cork stopper from a barrel, called a “bung”. An engraving from 1797 shows someone ice skating on the River Thames with a stick and bung. When British soldiers and immigrants went to Canada and the United States, they brought their stick-and-ball games. They played “hockey on the ice” during cold weather. Informal games borrowed from Native American stick-and-ball games. In particular, a Mi’kmaq game similar to lacrosse lent physical aggression to informal games of hockey. 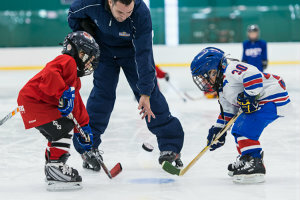 The first organized game of indoor hockey took place in Montreal on March 3, 1875. It was played between two teams of nine players. They used a circular, flat piece of wood rather than the more common bung or ball. The rules were derived from those used by England’s field hockey organization. The first hockey club was the McGill University Hockey Club, established in 1877, and team size went from nine to seven by 1880 (now hockey is played by six to a team, including the goalie). The first professional hockey players played for the Western Pennsylvania Hockey League by 1902. Because both sports require ice skates, the history of speed skating is rather similar to that of figure skating. Skating clubs in Norway began holding organized races on ice skates in 1863, probably the first organized competitions. Tracks were not of standardized length until 1892, when the International Skating Union set the length at 400 meters. World championships used race distances of 500 meters, 1,500 meters, 5,000 meters, and 10,000 meters. Speed skating’s first Olympic feature was in 1924 at the first winter games. In short track speed skating, four to six skaters start at the same time. They race in lanes around a rink with the same dimensions as an internationally-sized hockey rink. Long track speed skating is done in pairs on an oval ice track similar to an outdoor track course. The track has two lanes, and skaters switch lanes during their laps so they can cover the same distance. Whether for fun or glory, ice sports are a time-tested way to have fun in cold conditions. This list only accounts for some of them; if you’re at a loss, you can always fall back on the good ol’ snowball fight.